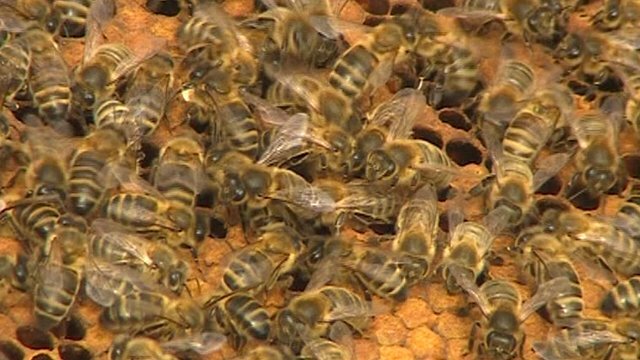 Bee experts in the East Midlands have said the recent changing weather has been the cause of honey bees starving to death. Margaret Cowley, from Derbyshire and the deputy editor of Bee Craft magazine, said during the warm March the colonies built up their numbers, but it was followed by a cold, wet and windy April. She said this meant the bees were not going out to collect nectar and pollen, which meant the hives were not full with honey causing the insects to die of starvation. Bob Logan, from Nottingham Beekeepers' Association, said they had been feeding the apiary at Woodthorpe Grange Park in Nottingham syrup of sugar and water to help keep them alive.